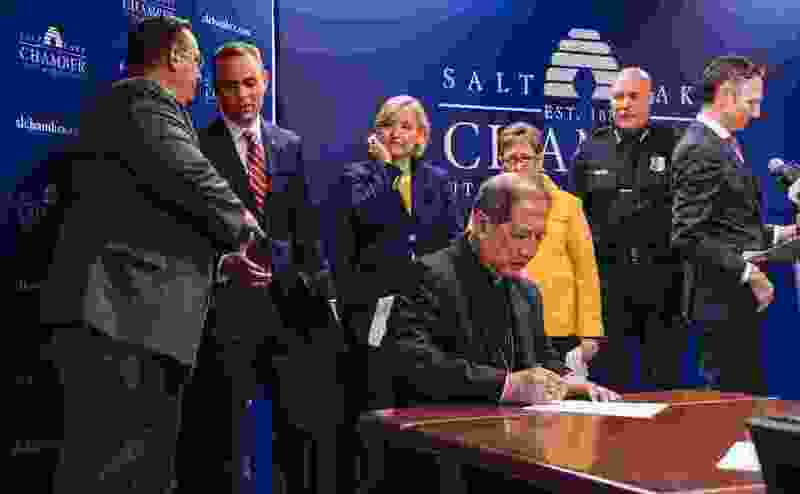 Leah Hogsten | The Salt Lake Tribune "Strong families are the foundation of successful communities," said Bishop Oscar A. Solis, leader of Utah’s Catholic community. "That is why we oppose all policies that unnecessarily separate families. We champion policies that are supportive of families, that contribute to the welfare and well-being of all children." Salt Lake City business and civic leaders gathered Wednesday to reaffirm the principles of the Utah Compact, initially adopted in 2010. The compact emphasizes humane treatment of immigrants, keeping families together and focusing deportation on serious criminals. FEDERAL SOLUTIONS Immigration is a federal policy issue between the U.S. government and other countries — not Utah and other countries. We urge Utah’s congressional delegation, and others, to lead efforts to strengthen federal laws and protect our national borders. We urge state leaders to adopt reasonable policies addressing immigrants in Utah. These 214 words have never looked more relevant. That is because so little has been done to actually address immigration in the nine years since the Utah Compact was signed. The compact is less about how to solve the immigration dilemma than it is about coping with it not being solved. Born out of an earlier flashpoint at the southern border, the Utah Compact represented a practical attitude. It was never a binding document, but it did bring together a wide, bipartisan swath of Utahns to put the state on record as supporting its immigrants regardless of their documentation. Now, with a president who has made demonizing immigrants a centerpiece, the people behind the Utah Compact felt the need to re-up. Business, religious and political leaders — many of whom turned out in 2010 — joined again last week to re-sign the compact as a reminder that the five bullet points are still guiding principles. Federal immigration legislation? It’s been years since any comprehensive immigration reform bill has gotten any traction in Congress. The protracted fight over a largely meaningless border wall puts useful legislation even farther down the road, but Congress remains the only path to any permanent solution. Local governments are not immigration police? The Trump administration has threatened to cut funding to cities that don’t enforce federal immigration laws, but it only lowers safety for everyone if immigrants have to fear local police. Unnecessarily split families? This is where compact creators were particularly prescient. They may not have foreseen the era of children in cages, but they recognized how arbitrary enforcement could produce longterm damage to families. Immigrants as vital to the economy? This is why the Salt Lake Chamber was behind both the original compact and the decision to bring it back out. Key segments of Utah’s economy rely on immigrant labor, and its absence would hurt us all. A free society? The Mormon pioneers arrived as refugees in 1847. Remembering that has helped make Utah a welcoming place for immigrants. Like the pioneers, they build a better world for those who follow. There’s a lot of empty talk around here about the “Utah way,” as if we’re smarter than everyone else. But the “Utah Compact” is indeed wise words for a weary world. Maybe someday — when rational immigration policy is the law of the land — we can stop bringing it back up.